Instead of dumping them out in the trash, plastic bottles can be converted into “Solar Bottle Bulb” to light the households in an eco-friendly way by using solar energy. An environment-friendly lighting project was developed and designed with the aim of bringing lights to the less privileged societies who could hardly afford to pay for electricity. The project called “A Liter of Light” was launched in the Philippines in August 2011 with the aim of offering hundreds of solar bottle bulbs at a very low price. With the help of the local government, 12 thousand solar bottle bulbs that sold for $1 each have been installed to 10,000 households in the five provinces in the country. Statistics from the National Electrification Commission report indicates that there are three million households within Metro Manila and nearby areas who are still living in the dark. The goal of the solar bottle bulb is to provide natural, simple, cheap and sustainable energy technology that addresses the essential needs of the local citizens nationwide. 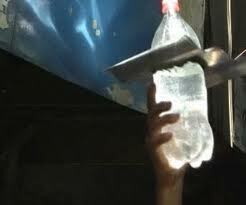 The concept behind solar bottle bulbs is fairly simple. To make one, just fill the 1.5 or 2 liters of clean and clear empty bottle with a clean tap or purified water. Add a little amount of bleach on it to make sure that the water will stay clear longer. Mount the bottle through the roof such that half of it is exposed outside and the other half inside. Seal the roof properly to avoid leaks. When the sun’s rays hit the outside part of the bottle, it will illuminate as bright as a 55- 60 watt incandescent light bulb.